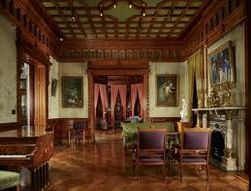 The museum is housed in the three-story, 24,000-square-foot Samuel M. Nickerson Mansion in Chicago's River North. The 20-room museum features Louis Comfort Tiffany glass panels, statues, wall art, lamps and chandeliers from the personal collection of Richard Driehaus. Accumulated over the last three decades, the collection is one of the largest personal collections of Tiffany objects in the world. The Driehaus Museum preserves and interprets the Gilded Age home of Chicago entrepreneur Samuel Mayo Nickerson in order to promote the understanding and appreciation of historic architecture and design.